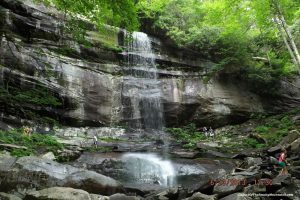 The waterfalls in Great Smoky Mountains National Park are perhaps the most memorable destinations, and one of the most popular waterfalls is Rainbow Falls, the tallest single-drop waterfall in the national park. This impressive waterfall drops its water 80 feet into LeConte Creek and is named for the rainbow that appears in its mist on sunny days. With such a popular destination, the trail to Rainbow Falls is well trafficked. It’s also quite strenuous, so you’ll likely encounter other hikers as you make your way up the mountain, including those taking brief rest stops to catch their breath along the way. The trail is 5.4 miles Round trip (2.7 mi each way) and it’s a steady climb uphill, with an elevation gain of more than 1,500 feet. Rainbow Falls Trail is rated Moderate, which is tougher than Easy, but not as tough as Difficult. A fit hiker can make the round trip in 3.5 hours, for others it can take 5-6 hours. It’s one of the most scenic trails, and the first part has plenty of access to the creek – so plan to make a day of it, and be prepared to turn around at any point. Although it takes energy, the destination is well worth the work to get to, and with great scenery all the way. And by the evening when you get back to your cabin, a soak in the hot tub on the deck – reflecting on a day well spent – is exactly what you will want to do. With the elevation gain, you’ll be on a steady incline your entire way to the Falls and frequently moving over rocky terrain. For this reason, make sure to bring water and snacks, and also have proper hiking shoes; the trail is not for flip flops or sandals. Ankle support and good sole tread will pay for themselves on this hike. And as with all trails, when it rains it gets slick. There can be several smaller waterfalls along the trail, including one very close to the finish – so don’t stop short, thinking you’re at Rainbow Falls. The Falls comes after the second footbridge. When you’re there, be prepared to be impressed – it’s a spectacular waterfall in one of the most scenic spots, perfect for a picnic. Plan to spend some time sitting on the (dry) rocks, enjoying the view, and digging into the food. A better sense of scale with the people present – and against all advice wearing sneakers and clambering on slippery rocks! Along the hike, you’ll see flowers and plants, lots of diverse foliage because of the high relative humidity of the area during the growing season. You’ll also see boulder fields, mini-falls, and probably a few deer. There is a log footbridge over LeConte Creek, and several more crossings – it might be a good idea to carry dry socks with you for the return hike, and bring a towel if you want to soak your feet in the water. Rainbow Falls is fun and roomy to hang out at and explore, but beware of wet and slippery rocks near the water – mist and algae make them particularly slippery and dangerous. The site is especially beautiful after a fresh rain, but this also makes the rocks – and also the creek banks – extra slippery. Serious injuries and several deaths have occurred from accidents here. Take care with each step, and watch children diligently. If you have very young children or those who may stray, this is not a suitable trail for your party. Water is the great resource of the Smoky Mountains – that “smoky” part is water vapor in the form of mist and fog or low cloud. Water accidents are also the most common form of accident in the national park – rains make new waterfalls out of nowhere, and rushing water can flood a creek from around a bend with no warning. It’s always worth reviewing what Great Smoky Mountains National Park advises about water safety. Good advice for any trip in the national park is to start early to avoid crowds. Rainbow Falls looks best with sunlight from the side rather than overhead as at noon. Always check the park’s Temporary Closures page before any excursion. 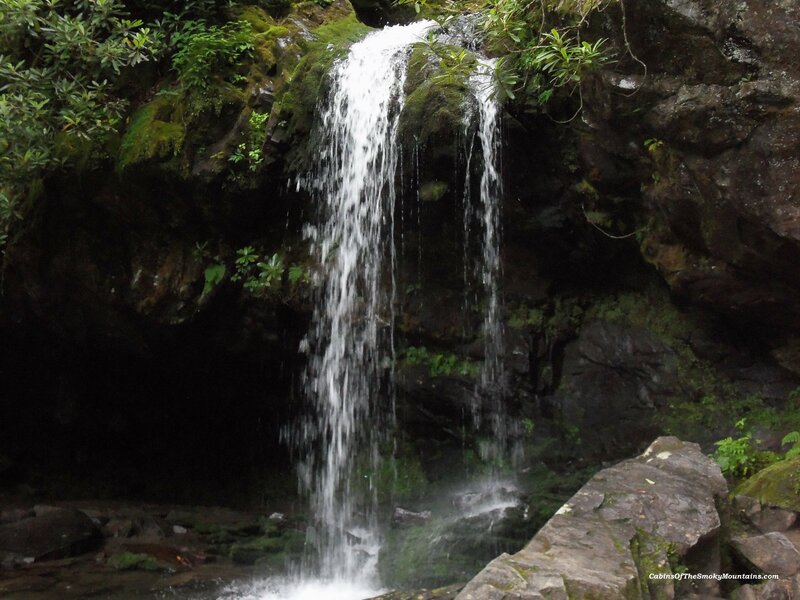 The Rainbow Falls trailhead is about 3 miles out of Gatlinburg, following Airport Road (Historic Nature Trail Road) from Traffic Light #8 on Parkway, into the national park, and taking the one-way Cherokee Orchard Loop road past the Noah Ogle home site. The parking area is well signed, and if it’s full, there’s more parking a little farther on. As an alternative to keep in mind, just past the Rainbow Falls parking area is the start of Roaring Fork Motor Nature Trail, so if you decide at the last minute not to make the hike, give yourself the treat of this famous scenic drive instead. NOTE – At the time of writing, through November 2017, Rainbow Falls Trail is closed for maintenance Mondays through Thursdays, and open Friday through Sunday and also national holidays. UPDATE – to see the progress on the trail in October, 2017 check this video. It was about halfway finished and expected to be complete by November of 2018. Amazing volunteer work.